Bring leaders together for support and continuing education in a progressive environment to develop the best practices in the Nation. Jon Eric’s first job was at P.F. Chang’s in Princeton when he was 16 years old, being trained in every position of the restaurant including management. By age 19 he attended Mercer County Community College and had completed a managerial internship through P.F. Chang’s that counted as credits towards his business management degree. After completing general education classes at MCCC, Jon transferred to The Catholic University of America in Washington D.C. After a year and a half at Catholic University, Jon decided to transfer into an entrepreneurship program at Louisiana State University. Jim Harper has worked at Hamilton Veterinary Hospital as the hospital manager from 1995 to 2004. He was promoted to Hospital Administrator in 2004 to present. Jim has spent more than 40 years in the veterinary field. Early years as a high school student Jim was enrolled in the Co-operative Industrial Education program at his high school as a veterinary technician. He was in the first graduating class of this program. Jim went on to Central Carolina Technical Institute in Sanford, NC and obtained an AAS Degree as a Veterinary Medical Technologist.Jim work in a small mixed practice in Mt Holly, NJ for several years while group local practices gathered their resources to build a 24 hour veterinary clinic named Columbus Central Veterinary Hospital. Jim worked at the hospital for 20 years as the surgical assistant to Orthopedic Surgeons Clark Dickinson VMD and Calvin Moon VMD and also had the title of Technical Supervisor. During that time Jim also obtained an AAS Degree Nursing and has maintained a valid license as a RN in NJ. Heidi Milano has been the working at Raritan Animal Hospital since 2010 and in 2012 became the Practice Manager. She started working as a receptionist and veterinary assistant back in 1994 at Midtown Animal Clinic in Manhattan. After working in several clinics in New York and New Jersey as a technician/ office manager, she switched tracks and went to work at a non-profit high volume spay and neuter clinic for 3 years as the Clinic Manager. Heidi is a member of the AAZK (American Association of Zoo Keepers non-working member) and has been a member of the VHMA since 2007. Heidi has worked in the veterinary field for over 17 years. Between the years of 2000 to 2002 she took time off to go back to school and work in the Multimedia production field. Carol Olea is the Client Services Manager at Red Bank Veterinary Hospital. She has been with the Red Bank Veterinary Hospital Network for fifteen years. She also participates in the Assistant Technician Program at Brookdale College teaching a class in Client Services. She graduated from Union College and pursued an Equine Career with Thoroughbred Racehorses. She was the main assistant to Daniel Lopez Racing Stables located in NY and NJ for ten years. She left the Equine Business to pursue a career in Veterinary Management. My name is Eileen Schuck and I am the Director of Vet-I-Care. Working at NorthStar VETS Emergency Specialty Veterinary Practice has truely inspired me to forward this foundation towards its mission. It is nearly unbearable at times watching healthy animals get put to sleep because their owners can't afford the veterinary help that is needed to save them. I am happy to know that now I can directly make a difference by actively raising funds and awareness about Vet-I-Care. My inspiration comes from the pets and families that did not have this benefit and the future one's that will. I am honored to be a part of the Vet-I-Care team! I joined NJVHMA board in 2015 and has been active in fund raising and meeting support. Stephen's focus is designed about refining opportunities in the veterinary field. Focused on real life solutions to common and core problems we walk you through the transition periods. Small project or long term culture change? He is with you every step of the way. Owners, management, supervisors, front office staff, technicians. We have it all and everyone works for the one common goal of empowering each other to produce the very best in veterinary care and service to our clients and patients alike. Since 1998, Mandi has been enjoying the field of veterinary medicine. She began her career as a client service representative. Having a lifelong love of animals, it's no wonder that she quickly fell in love with the industry. She later accepted a full time technician position and enjoyed several years of hands-on nursing with the development of her technical and surgery skills. In 2002 she accepted the position as Hospital Manager and has enjoyed developing hospital procedures, facilitating client and community educational programs, and being the project manager for her hospital’s two expansions. She is passionate about creating a positive hospital environment where both the team and the clients/patients benefit. 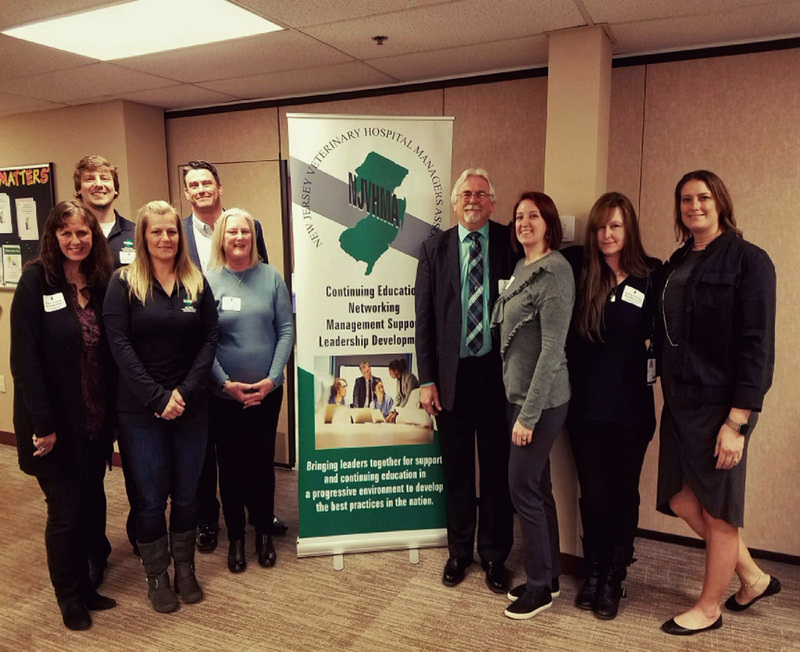 She is a Board Member of the New Jersey Veterinary Hospital Managers Association, and a member of the Veterinary Hospital Managers Association and the New Jersey Veterinary Medical Association.